Ali (Rtd), has complied with the directive of the Senate to announce a suspension of the implementation of the payment of the proposed vehicle duty. 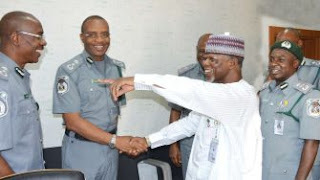 “They both agreed that the proposed motor duty payment, though in line with the provision of Customs and Excise Management Act (CEMA) Cap C.45, LFN 2004 should be put on hold while the Senate Committee on Customs & Excise interfaces with the NCS for further discussions. “While payment of duty on vehicles or indeed any dutiable imported item remains a civic responsibility of every patriotic Nigerian, NCS Management has directed that the exercise be put on hold while expressing readiness to engage the Senate Committee on further discussions to bring them on board to understand the importance of the exercise to national security and economy,” Attah stated.